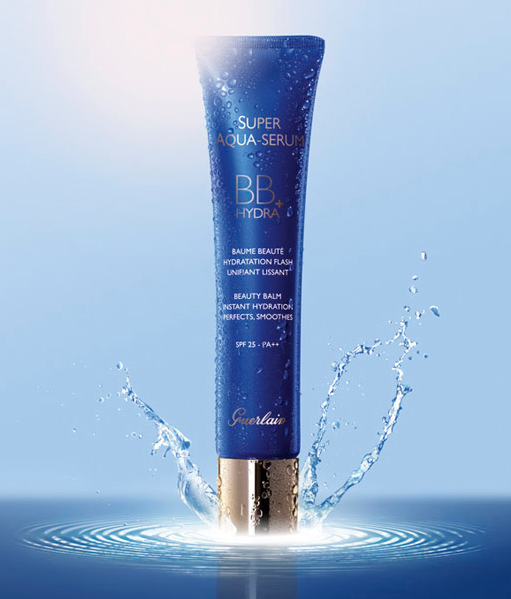 Long-lasting hydration and a beautiful tint in one step with the Guerlain Super Aqua Serum BB Hydra+ Beauty Balm, a powerful age-defying makeup hybrid. Designed for those with dehydrated skin who wish to restore a youthful glow, this BB cream utilises the infamous Aquacomplex of Guerlain’s Super Aqua Serum, which purifies cellular water and improves its circulation throughout the layers of the skin. With its delicate coverage and ultra light texture, this luxurious beauty balm perfects the complexion with a radiant glow, while its luxurious formulation sets to work on smoothing out wrinkles, plumping skin with 12 hour hydration, and protecting skin from prematurely aging UV rays with SPF25. Available in two shades: 01 Light, a neutral hue for paler tones and 02 Medium, a warmer shade.